Breaking News! Anthony Weiner's Wife is Pregnant! There it was in bold Gallup-type headlines. Solid Majority of Jewish Americans Still Approve of Obama Changes in approval among Jews continues to reflect broader U.S. patterns. The problem with the headline is that it is Dishonest. Assuming the overall Jewish American approval numbers are correct, they gave President Barack Obama a 60% job approval rating in June, down from 68% in May, but statistically unchanged from 64% in April and drastically below the 83% at the beginning of 2009, but its the comparison to the general population that is disingenuous. Gallup's monthly trend in Jewish approval of Obama continues to roughly follow the path of all Americans' approval of the president, more generally, as it has since Obama took office in January 2009. The 14-percentage-point difference in the two groups' approval ratings in June -- 60% among U.S. Jews vs. 46% among all U.S. adults -- is identical to the average gap seen over the past two and a half years. However, the monthly graph is somewhat variable due to the lower monthly sample size of Jewish respondents (around 350). 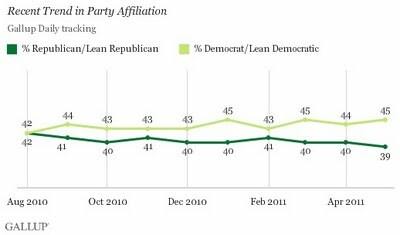 But the latest Gallup figure I could find for Jewish party affiliation (Sept 2009) shows that American Jews are almost 50% more likely to be Democrats than the average American. Why is this important? Because Obama's approval rating has not fallen of as much for Democrats as it has for Republicans. Using numbers from April 2009 and May 2011 Gallup reports we find that the Democrat approval fall off is less than a third of the total US figures. Using the May numbers (which are available but different than the ones Gallup reported today) we find that the adjusted fall off of Obama approval is much less than that of the "total US figures (21% to 34%). 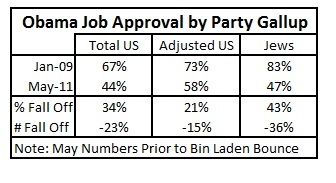 We also find that the fall off of Jewish approval of President Obama is more than twice that of adjusted numbers. While I wouldn't use the exact numbers I am confident in saying that the fall off of the President's approval, is much larger than that of the equivalent general population. In other words, Gallup's main proposition is wrong. With a major organization such as Gallup when there is a "bogus" survey, it usually is in the sample mix (i.e. weighted to heavy toward one group), or the analysis. Without having the sample mix for Gallup, I cannot comment on that, but the entire set-up of the analysis is misleading at best, intentionally dishonest at worst. First of all, taking a look at the approval point spread difference as Gallup does at the start of its analysis doesn't make sense because the Total US and Jewish Vote fall offs are working off of different bases. Ten percentage points off of 60% is a bigger hit than 10% off of 80% something that Gallup does not acknowledge. More important is the fact that comparing President Obama's loss of approval in the Jewish community, which is 66% Democratic, to the loss of approval of the entire population which is only 43% Democratic is not an honest comparison because the President has maintained his approval much better amongst Democratic voters. The old proverb says there are three kinds of lies: lies, damned lies, and statistics. Today Gallup's Jewish vote survey has proved that proverb very true. Bringing Middle East (and International Affairs) Studies into the Twenty-First Century. AT AMAZON, markdowns on office electronics…. Charles Rangel on Debt Ceiling Debate: What Would Jesus Do? Derek Jeter Gets 3,000th HIt! Lizzie Palmer, who put this YouTube program together, is 15 years old. Candidates Lure Voters With Bacon - YUM! Senator Johnson: No to “Business As Usual”!